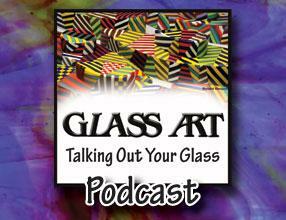 Glass Art editor Shawn Waggoner reminds readers of the legacy of architectural stained glass artist Jean-Jacques Duval and how hot glass artist Josh Simpson experiments with glass formulas and mineral compounds to create his intricate, otherworldly orbs. She also shares how BioGlass presents educational opportunities, research and development, and solutions for maintaining economic stability in the glass industry and making a smaller carbon footprint possible. Jean-Jacques Duval, over his eighty-two years as a stained glass artist, has always created the best in design and workmanship for the architectural settings and environments in which he works. One example of that is the fact that he hand-cuts all of the faceted glass dalles that he incorporates into his large ecclesiastical creations. The seventh annual conference of the American Glass Guild (AGG) will feature workshops and lectures by internationally known stained glass artists, art historians, and conservators. The conference will also include the annual auction to benefit the organization’s educational mission and the James Whitney Scholarship Fund plus, for the first time, a members’ juried exhibition. Ed Hoy’s International challenged its partners to inspire their customers by adding new attention-getting elements to their websites and displays. Judy Shumway of Glass Garden in Janesville, Wisconsin, took the challenge to heart and had a new eye-catching Web page created for the company’s website that spotlights all of the classes, products, events, and patterns that the shop has to offer. Laura Hallock, who chooses to attract her own customer base rather than depend on the drawing power of neighboring businesses, pursues her goal by making her classes appealing and inviting. Her principal tool is a Constant Contact mailing list of almost 1,000 clients to whom she reaches out with specialized, targeted offerings. The Society of American Mosaic Artists (SAMA) was presented with a unique opportunity to showcase the mosaic art form at the International Sculpture Objects & Functional Art Fair (SOFA) in November 2011. SAMA’s mission to educate the public and promote contemporary mosaic art in all of its varied forms was at the core of the SOFA experience. Design lines in stained glass artwork are important, but they often show as black and prominent with the light source coming from behind them. In representational stained glass art, however, when plated glass techniques are used and design lines are carefully designed and implemented, those lines can actually enhance the sense of depth in a design. Many artists who were formerly hesitant about pairing up with others for fear of fueling the competition have come to realize that collaborating with artists with similar but not identical work can benefit both artists. Social media venues such as Facebook and Twitter provide the perfect place to help promote artwork and coordinating supplies to the visitors of both sites. Safety is one of the most important considerations an artist can make when planning a trade show booth. Key areas to monitor include whether the booth structure is fireproof, windproof, and lean proof. To ensure success, providing a space for customers that is comfortable and inviting is also paramount. The path to inspiration for independent artists as they work on commissioned pieces often comes from folklore plus the interests of the person who is commissioning the art. Once the theme for a large work is established, creating a prototype is essential before proceeding on to the actual creation. Josh Simpson’s work, which is the product of continual experimentation with glass formulas and mineral compounds as well as the exploration of color, shape, and texture, is a product of his long-standing fascination with space. His small, paperweight-like alternate universes, with their intricate, swirling gases and clouds, have been inspired by following fifty years of space exploration and by the involvement of his astronaut wife, Cady Coleman, in the U.S. Shuttle space program. Margaret Neher, who became interested in flameworking after spending a number of years as a stained and etched glass artist, fabricates fruits, flowers, and other subjects from nature. She has developed techniques that allow her to assemble and fuse work that is sound while still providing ways for her to produce the fine detail that is one of the hallmarks her art. Many hot glass studios have closed around the world due to the rising costs of the fossil fuels required for production. BioGlass, a global nonprofit, is developing solutions and educational opportunities plus research and development that make those costs lower while also helping to reduce the carbon footprint of the glass industry. 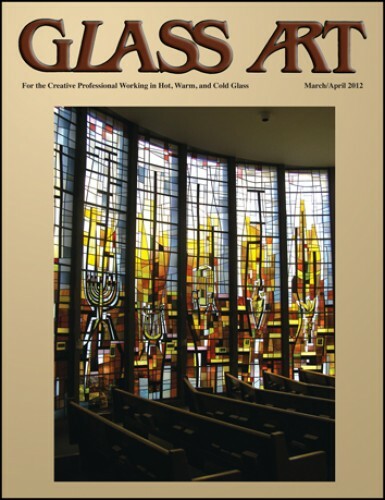 Information on the latest in new glass types and colors, supplies and tools, kilns, books and patterns, and anything else that glass artists and enthusiasts need for working in hot, warm, and cold glass can be found in the What’s New section of Glass Art. Preliminary research is an important part of planning and implementing the production of an educational video, which needs to be as good or better than the quality of what is already available from other sources. Doing a little homework to determine the quality and availability of the many resources that are already available for the same field will give artists a good sense of where they stand. Boyce Lundstrom offers a look at the freshness of spirit and attitude that is found in the creation of the American Raku process, which is hallmarked by splashing on a glaze and leaving large brush marks. This tutorial highlights the steps required for the Raku process, offers tips for incorporating found objects, and provides kiln schedules for the full-fuse debubbling as well as the slumping portions of the project.